This machine provides a sliding Control Panel. Press this key to display the Help Menu. This function displays the explanation and operation procedure of a function on the Touch Panel, enabling you to view them. Press this key to interrupt active jobs on this machine and deal with a quick copy job. In interrupt mode, the Interrupt indicator lamp lights up green, and the message [Interrupt Mode in effect.] appears on the Touch Panel. Press this key to display a finishing image with the current settings on the Touch Panel, so that you can view it. This function prints only one copy before processing multiple copies, and enables you to check the proof copy. This is useful for preventing misprinting from occurring. Press this key to change the display of the Touch Panel to Enlarge Display mode. For details on Enlarge Display, refer to Here. Use this keypad to enter numeric values such as the number of copies or zoom ratio. This keypad is also used to select a numbered setting key. Press this key to clear all numeric values, for example, the number of copies, zoom ratio, and size that you entered using the Keypad. Allows you to use the voice guidance function, which is one of the advanced functions. Press this key to start or end the voice guidance when the Enlarge Display, Accessibility, or Guidance screen is displayed on the Touch Panel. To use the voice guidance, install Upgrade Kit, i-Option LK-104 v3, or Local Interface Kit. To delete, select a target job in the currently stopped screen, then press [Delete]. Press this key to switch this machine to Power Save mode. If the Power key is pressed while this machine is active, the sub power is turned off to reduce power consumption. 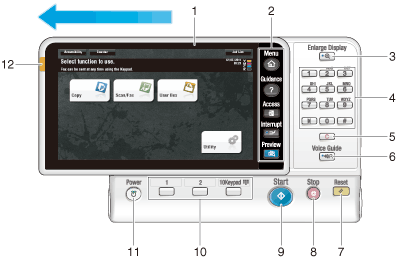 While the sub power is turned off, this machine can receive data or faxes, however, it cannot scan or print an original. If the Power key is held down while this machine is operating, Power Save mode shifts to the ErP Auto Power Off mode (close to Main Power Off mode), which offers a higher power saving effect than Sub Power Off mode. In ErP Auto Power Off mode, this machine cannot receive data or faxes, and also it cannot scan or print an original. The Power key can also be used as a power save key to switch to Power Save mode. For details on how to use the Power key, refer to Here. If necessary, you can adjust the angle of the Control Panel to make it easier use. For details on the adjustment, refer to Here.